Figure 1. Overview of the exhibition hall. Could a maze of random brush strokes pause the human mind, throw its never-ceasing clock off rhythm for a split second and force it to orbit around the shiny eclipse that embraces the centre of galaxy black? Is it possible to entrap in a magical vessel cast from the clay of very few lines, a message so complex emotionally that it creates the time to stop and wonder? Is it possible to fashion subliminal visions encoded in the very same simple lines linked together by a symbiotic spiritual bond existing between them, encompassing the soul of their creator and the viewer? Is it possible to carefully design a story from the debris of the memories of life, a story that crosses boundaries of culture, language, faith, and personality? The answer is in the affirmative, but only when the mind is one with the brush. Figure 2. 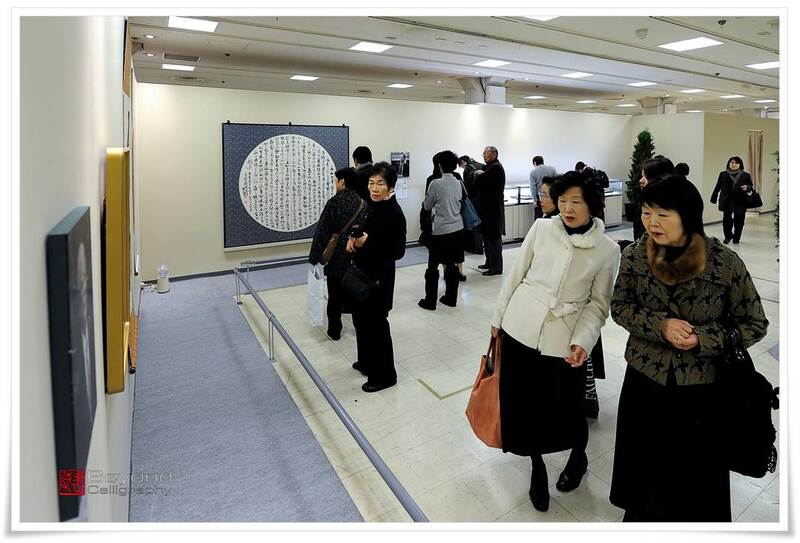 Fragment of the exhibition hall, with a circle-shaped calligraphy by Master Kawano Takashi (河野隆) , in the background. Calligraphy, like music, is based upon harmony. It takes a Master Calligrapher to compose a symphony of ink, a masterpiece as brilliant as nature itself, one that will infiltrate undetected into the deepest recesses and most secluded heavens of your heart. Calligraphy, at its best, presents the truth of the Cosmos. It cannot be interpreted, digested, or logically explained. It simply exists to be embraced by calligrapher and viewer. Always mindful of these philosophical tenets, seeking the alluring realms of possibility, two calligraphers and one photographer, all artists, set out together to explore and share with you, the readers, the kingdoms found if one but takes the time to breathe and absorb. On January 2012, Beyond Calligraphy, together with Yanagisawa Sakiko (柳澤咲子, やなぎさわさきこ), went to see an exhibition of the twenty most renowned modern Japanese calligraphers (現代書道二十人展, げんだい　しょどう　にじゅうにん　てん, gendai shodō nijūnin ten, lit. “20 people exhibition of modern calligraphy”) a concerto grosso in ink major. 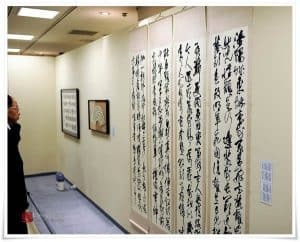 The event was not huge in scale (approximately 100 works), but the energy of the sum of all those magnificent calligraphy works was overwhelming. We have managed, (thanks to Sakiko), to reach two of the twenty Masters and have received their permission to reproduce images of their work on our site. In the near future we would hope to and look forward to meeting all of them. 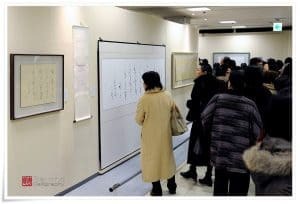 In this article, I will write about the event in general and those who exhibited their work. Parts II and III will focus on the two particular Masters and their calligraphy. Figure 5. Works of Master Furutani Souin (古谷蒼韻) in the background. Kuroda Kenichi (黒田賢一, くろだ　けんいち, 1947 – present), Kuiseko Hakuju (杭迫柏樹, くいせこ　はくじゅ, 1934 – present), Kawano Takashi (河野隆, かわの　たかし, 1948 – present), Arai Koufuu (新井光風, Arai Kōfū, あらい　こうふう, 1937 – present), Ikeda Keihou (池田桂鳳, いけだ　けいほう, Ikeda Keihō, 1935 – present), Ishige Keidou (井茂圭洞, いしげ　けいどう, Ishige Keidō, 1936 – present), Eguchi Taishou (江口大象, えぐち　たいしょう, Eguchi Taishō, 1935 – present), Takagi Atsuhito (高木厚人, たかぎ　あつひと, 1953 – present), and Kakumoto Seisan (角元 正燦, かくもと　せいさん, 1947 – present). Figure 6. 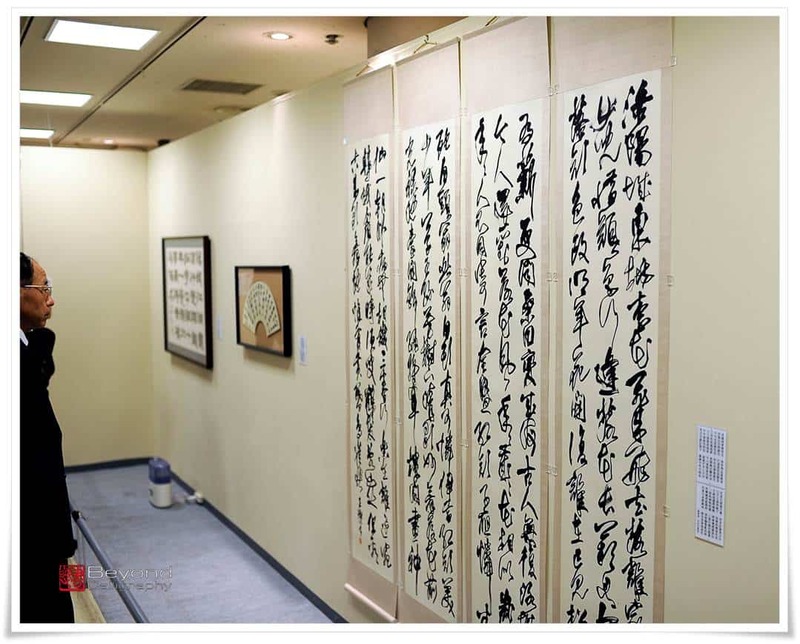 Glass showcase displaying beautiful calligraphy seals carved by Master Seki Masato (関 正人) . The above Masters, aside from being exceptional calligraphers, are leaders of prominent calligraphy organisations, professors at various universities, authors of books, calligraphy dictionaries and other scholastic materials that are commonly recognised in Japan as outstanding, as well as laureates of prestigious awards such as The Japan Fine Arts Exhibition Award (日展会員賞, にってんかいいんしょう, Nitten kai-in shō) given by the Japanese Ministry of Education and Culture. The two Masters about whom I will write in greater detail in subsequent articles are Master Hibino Kouhou (日比野光鳳) and Master Furutani Souin (古谷蒼韻). The exhibition was held at the Matsuzakaya Art Gallery (松坂屋美術館, まつざかや　びじゅつかん, Matsuzakaya Bijutsukan) in central Tokyo. It was the 56th time that this event had taken place. Each year the exhibition travels all over Japan. 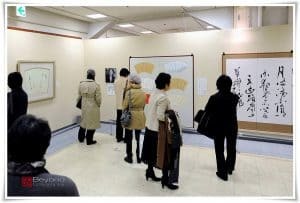 I have visited many calligraphy exhibitions and, with the exception of those held in museums, none required an admission fee. This particular one was different and rather expensive. 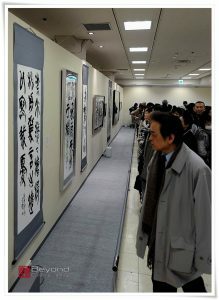 Nonetheless, I have never seen such large crowds anxious to see calligraphy art. We had to squeeze through the constantly flowing streams of people, and, as you can see from the pictures, it was quite a task to get any well framed photographs even though Dave and I are really tall. Figure 7. Part of the exhibition hall where works of Master Yokoyama Kouhei (横山煌平). 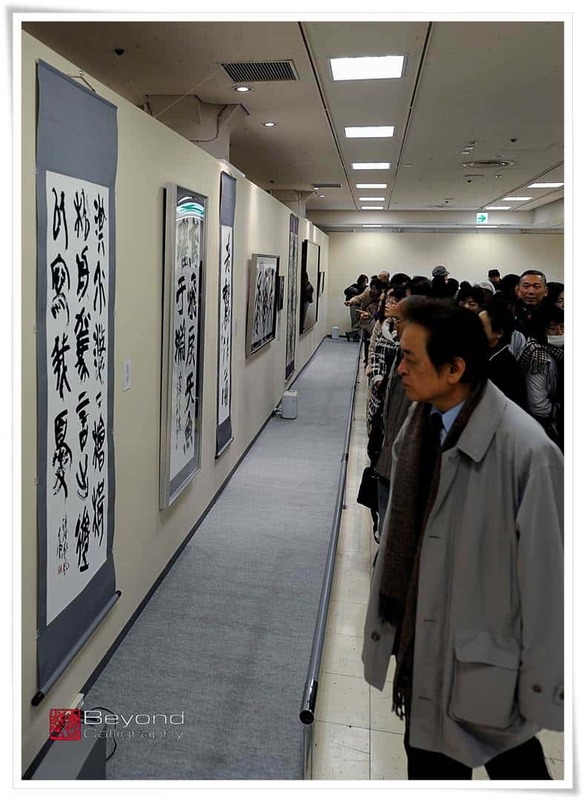 For informational purposes, it should be stated that calligraphy was not the only theme of the exhibition. In Figure 6, one can see a display case filled with calligraphy seals. Some of them are mesmerizingly beautiful, truly amazing works of art lavishly decorated with enchanting carvings of various motifs including but not limited to dragons, Chinese turtles, and sceneries. I would love one day to visit both of the artists who displayed their seal masterpieces, Master Kawano Takashi (河野隆) and Master Seki Masato (関 正人), and to see their work within the context of their studios and private collection. ← Skyrim in Calligraphy – The Legend of The Dragonborn in Ink and Paper. What an outstanding event! Such great shodō and tenkoku displays. I really like the way the hanko (seal carvings) are presented for display and would love to see some close up photos someday? Finally, I really enjoyed reading this poetic introduction, very well written. Thank you, Steve. We are hoping to visit those Masters who exhibited their works during this event. However, it may take some time to reach them. 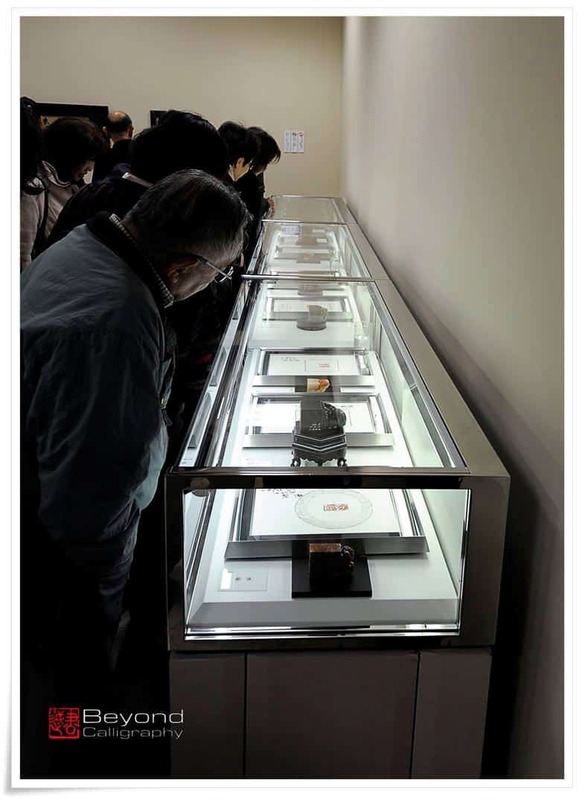 The seals were absolutely amazing, and I would really love to see the whole private collection. They would probably need a Police to remove me from the house, haha. The work is simply wonderful, and it is inspiring! Thank you for offering this opportunity to view a selection of the work and to acquire an introductory knowledge of the art. 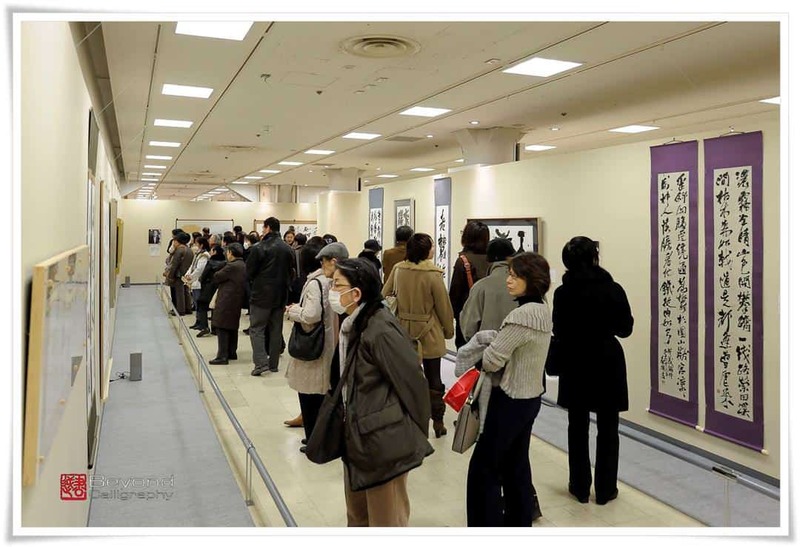 I would be grateful for a bibliography on historical and contemporary calligraphy in Japan—including catalogs of exhibits.